Children at the Richfield Church of Christ are important and vital to the congregation. We are dedicated to making their spiritual growth a priority. One of the ways this is done is through Bible classes held on Sunday mornings and Wednesday evenings. 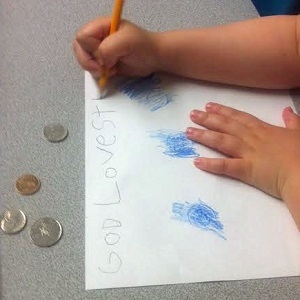 Cradle Roll (0-24 months) – Even the youngest among us can learn about God! This is proven by the wonderful, dedicated teachers we have in the Cradle Roll class. The class is purposefully repetitive in nature, helping your child feel welcome and comfortable in their first classroom setting. Topics often cover the basics of Bible class, family and creation with lots of hands on participation and interaction in class. 2-3 Year Olds – This class has a lot of energy! Each month your child will study a new topic. In 2014-2015, kids are studying New Testament topics. Next year, the class will focus on Old Testament characters. This is a fun, interactive class with many visuals and crafts. The repetitive curriculum during the month encourages the kids to really learn about the topic/character. Your child will be coming home excited to share what they learned in Bible class! Elementary Education – We generally divide this group into two classes: PreK-2nd grade and 3rd-6th grade. Each class is going through the Bible chronologically at a depth appropriate to the age group. This year they are studying the New Testament and next year they will study the Old Testament. This will give your child a comprehensive look at the Bible in an organized fashion. On Sunday mornings the purpose is telling the story from the Bible in an engaging way. Wednesday evenings are spent reviewing the lesson through games and activities. Through these lessons and memory work, teachers are helping to equip students with the knowledge of God's truth and practical application. Your child will have fun learning about the Bible! The classes on Sunday morning and Wednesday night would not be successful without the dedication of wonderful teachers and children's ministry supporters. The teachers care for their students inside and outside of the classroom. Students feel special knowing that these adults are rooting for them and praying for them. We hope you will visit RCC Kids. We love to have new friends in Bible class!